The death of a 17-year-old silverback gorilla at the Cincinnati Zoo last weekend triggered massive public debate almost immediately. News that Harambe, a male lowland gorilla introduced to the zoo just one year ago, was shot dead by the zoo's Deadly Animal Response Team after a child crawled through a barricade and fell into the animal's enclosure left many people divided over who was at fault. Reactions to Harambe's tragic death have ranged from pragmatism to utter outrage, with dozens of petitions springing up as dispute over the matter continues to trend across social media. With well over 30 Harambe-related petitions on change.org alone, you're bound to find a petition you can get behind, if that's how you choose to express your opinion. No matter where you stand on Harambe's death (or who you think might be responsible), there's a petition for that. No kidding. Are you an outraged animal rights supporter who wants to see Cincinnati Zoo officials reprimanded for their decision to shoot to kill? There's a petition for that. Are you an upset gorilla enthusiast looking to see these primates removed from zoos and placed in recognized animal sanctuaries? There's a petition for that too. Are you a sympathetic parent tired of calls to hold the boy's parents responsible? Yep, you guessed it, there's a petition for that as well. If You're Seeking "Justice For Harambe"
One of the most widely circulated petitions related to Harambe's death is one titled "Justice For Harambe." With nearly 500,000 signatures, the petition calls for "the parents to be held accountable for the lack of supervision and negligence that caused Harambe to lose his life." The petition goes on further to state the undersigned "actively encourage an investigation of the child's home environment in the interests of protecting the child and his siblings from further incidents of parental negligence." A second petition titled "Support 'Harambe's Law' for the gorilla killed in Cincinnati" seeks to petition Ohio lawmakers to establish "laws protecting them [animals] from negligence of the public visitors." The petition, which has collected nearly 200,000 signatures, proposes the enactment of "Harambe's Law" so "there are legal consequences when an endangered animal is harmed or killed due to the negligence of visitors." For those who feel it is animals that need protecting from humans, there's a petition titled "Safer conditions for animals confined in zoos," which has garnered nearly 18,000 signatures. The petition argues "zoos holding animals captive have an obligation and responsibility to protect the animals" and asks the Association of Zoos and Aquariums to have zoos "build higher more secure enclosures to protect the innocent animals held captive from being murdered due to human ignorance." If you're saddened by the death of Harambe but unwilling (or maybe just conflicted) to `wade into the debate over who, if anyone, is to blame, you might find solace in joining more than 15,000 people by signing a petition asking the Cincinnati Zoo to erect a memorial in Harambe's memory. "Having a memorial in Harambe's name would bring some peace to the situation," the creator or the "Make a memorial for Harambe" argues. 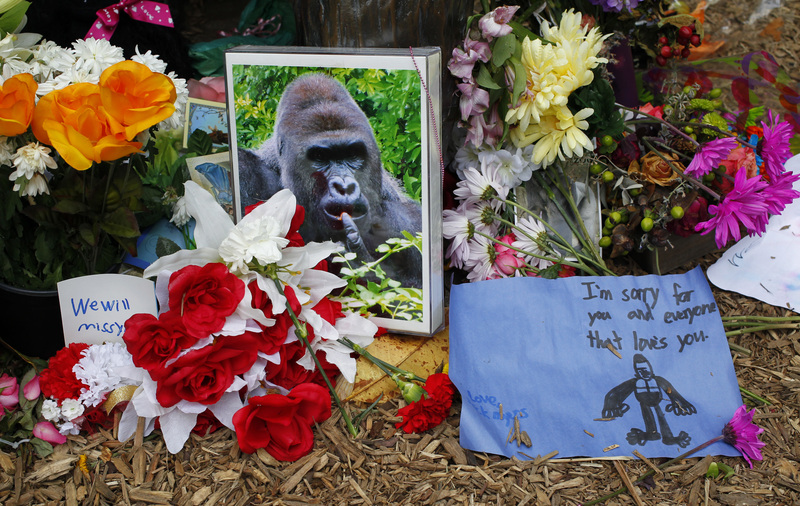 One petition created shortly after news of Harambe's death broke compares the incident at the Cincinnati Zoo to a 2007 incident in which Bokito, a male Western gorilla, broke out of his enclosure to attack a woman before being tranquilized and returned to his cage by zoo officials. The petition seeks legislation that would enforce the use of tranquilizers at zoos in situations such as the one that led to Harambe's death. The petition also asks for enclosure standards at zoos to be revised. A petition calling for Cincinnati Zoo Director Thane Maynard to be fired over Harambe's death has so far gathered just over 330 signatures thus far. The petition also asks for the mayor of Cincinnati to file criminal charges against Maynard "for the violation of the Animal Welfare Act and for killing an endangered gorilla." "Join us in our fight to give basic human rights to Animals [sic]," a petition urging PETA and President Barack Obama to give animals voting rights asks. With just 203 signatures, the petition hasn't quite enjoyed the same level of "success" that some of the other Harambe-inspired petitions currently on change.org have. Nonetheless, the "Animal Voting Rights" petition seeks "to protect animals like the late Harambe" by viewing these animals as "equals."